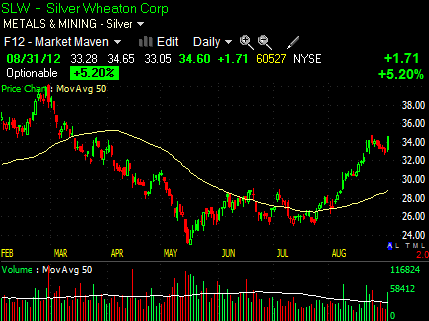 Is A Big Move In Silver Stocks Starting? 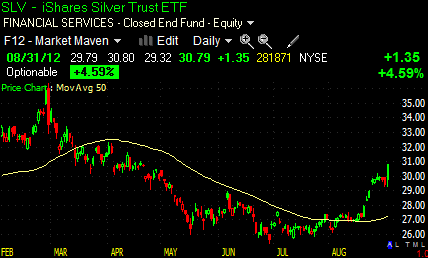 Besides individual silver stocks and the silver ETF itself, there is another way to participate in the move. AGQ is a ‘Leveraged ETF' based on the price of silver. 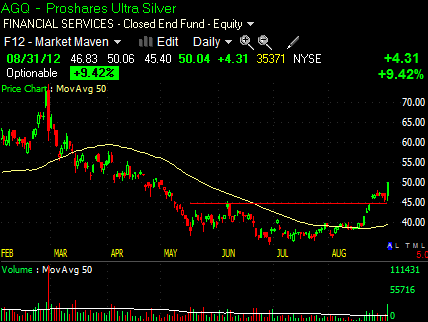 From its description, “ProShares Ultra Silver seeks daily investment results, before fees and expenses, that correspond to twice (200%) the daily performance of silver bullion as measured by the U.S. Dollar fixing price for delivery in London.” This means that moves in the price of silver are amplified. For any given move in silver, gains will be larger, but so will losses. AGQ formed a high probability chart pattern. It based for three months on low volume, but has recently broken above resistance on a gap-up with sharply increased volume. A slight pullback would offer a better entry point. It's looking pretty strong though, so there may not be much of a pullback. Another caution to keep in mind is that this ETF is still thinly traded, meaning fills may be poor on larger purchases and sales. Remember, the advantage of a leveraged ETF such as AGQ can also work against you. If the price of silver starts falling, AGQ will give up gains, then rack up losses quickly. A leveraged ETF position needs to be closely watched and managed.